The ceremony of the taking off of a brother-in-law's shoe by the widow of a brother who has died childless, through which ceremony he is released from the obligation of marrying her, and she becomes free to marry whomever she desires (Deut. xxv. 5-10). It may be noted that only one brother-in-law need perform the ceremony. The old custom of the levirate marriage (Gen. xxxviii. 8) is thus modified in the Deuteronomic code by permitting the surviving brother to refuse to marry his brother's widow, providedhe submits to the ceremony of ḥaliẓah (see Levirate; Yebamah). 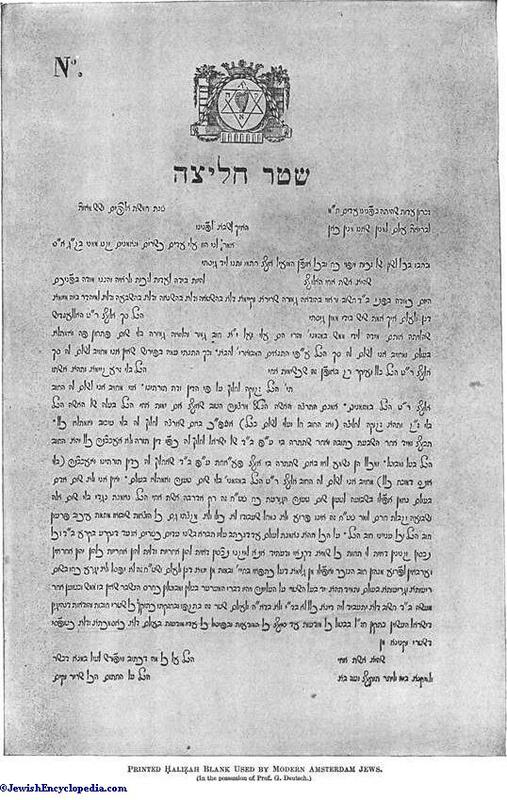 In the Talmudic period the tendency against the original custom was intensified by the apprehension that the brother-in-law might desire to marry his brother's widow from other motives than that of "establishing a name unto his brother," and therefore many rabbis of Talmudic as well as of later times preferred ḥaliẓah to actual marriage (Yeb. 39b). Thus the ancient institution of the levirate marriage fell more and more into disuse, so that at present ḥaliẓah is the general rule and marriage the rare exception (Shulḥan "Aruk, Eben ha-'Ezer, 165, and commentaries). In theory, however, the Biblical law of levirate marriage is still presumed to be in force, and in the ceremonies attending upon ḥaliẓah the presumption is that the brother-in-law brings disgrace upon himself and upon his family by refusing to marry his brother's widow. The ceremony as described in Deuteronomy (l.c.) is very simple. 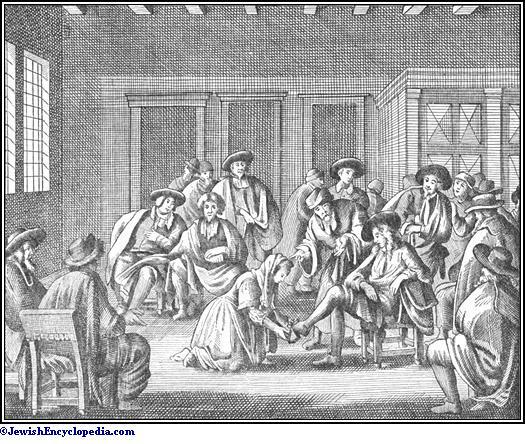 The widow loosens the shoe of the brother-in-law in the presence of the elders of the town, spits upon the ground before him, and pronounces a certain prescribed formula. This ceremony, however, was later elaborated by the Rabbis, making the act more solemn and more public. The Rabbis declared that the ceremony should take place before a court of three, who need not be very learned, but must at least understand Hebrew (Yeb. 101a; Shulḥan 'Aruk, Eben ha-'Ezer, 169, 1). All those who are disqualified from testifying in legal matters (see Evidence) are disqualified also from acting on this board of judges (Yeb. 101a). These three should appoint two others to assist them, and at the service on the evening preceding the day of the ceremony they should appoint a place for its performance, so as to give the matter more publicity. The place chosen is usually the synagogue court or the house of the rabbi, although the ceremony may take place in the house of the widow. All investigations with regard to the parties concerned in the ḥaliẓah should be conducted on the previous day, on which both are instructed in the details of the ceremony, and on which the "yebamah" (widowed sister-in-law) is not allowed to partake of any food. The ḥaliẓah should not be performed in the evening (Yeb. 104a), nor on a Sabbath or a holiday (Beẓah 36b), nor on the eve of a Sabbath or a holiday ("Terumat ha-Deshen," § 227). 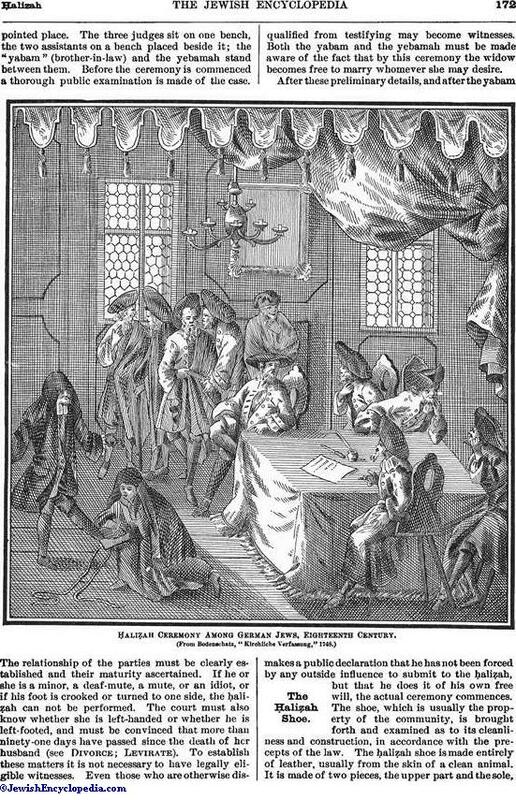 ḤaliẒah Scene in Holland, Early Eighteenth Century. On the day set for the ḥaliẓah, immediately after the morning service, when all the, people are still in the synagogue, the three judges and their two assistants, who also act as witnesses, repair to the appointedplace. The three judges sit on one bench, the two assistants on a bench placed beside it; the "yabam" (brother-in-law) and the yebamah stand between them. Before the ceremony is commenced a thorough public examination is made of the case. The relationship of the parties must be clearly established and their maturity ascertained. If he or she is a minor, a deaf-mute, a mute, or an idiot, or if his foot is crooked or turned to one side, the ḥaliẓah can not be performed. The court must also know whether she is left-handed or whether he is left-footed, and must be convinced that more than ninety-one days have passed since the death of her husband (see Divorce; Levirate). To establish these matters it is not necessary to have legally eligible witnesses. Even those who are otherwise disqualified from testifying may become witnesses. Both the yabam and the yebamah must be made aware of the fact that by this ceremony the widow becomes free to marry whomever she may desire. 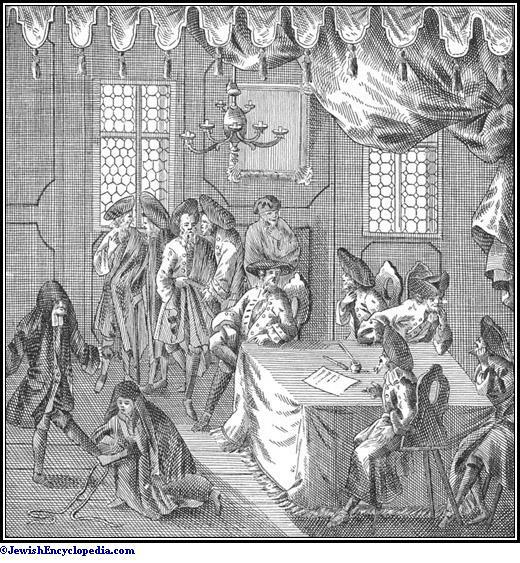 Ḥaliẓah Ceremony Among German Jews, Eighteenth Century. After these preliminary details, and after the yabam makes a public declaration that he has not been forced by any outside influence to submit to the ḥaliẓah, but that he does it of his own free will, the actual ceremony commences. The shoe, which is usually the property of the community, is brought forth and examined as to its cleanliness and construction, in accordance with the precepts of the law. The ḥaliẓah shoe is made entirely of leather, usually from the skin of a clean animal. Printed Ḥaliẓah Blank Used by Modern Amsterdam Jews. It is made of two pieces, the upper part and the sole, sewed together with leather threads. 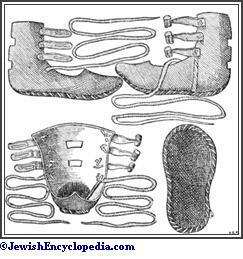 Three small straps are attached to the front of the shoe, each of which has a knot ("ḥumrata") at the top to fit a hole made on the other side of the shoe. Two white leather straps are attached to either side of the shoe, by which it is fastened to the leg. The yabam must have his right foot, on which the shoe is placed, washed very scrupulously, and after he has strapped it on he must walk four cubits in the presence of the judges. Then the chief of the judges reads the following passage, which the yebamah repeats word for word: "My brother-in-law refuses to raise unto his brother a name in Israel; he will not marry me"; then the yabam is required to repeat the sentence: "I do not wish to take her." He then presses his right foot against the floor while she loosens the straps with her right hand and, holding his leg in her left hand, takes off the shoe and throws it some distance away. Then she places herself in front of the yabam, spits on the floor in front of him, and repeats these words after the presiding judge: "So shall it be done unto that man who will not build up his brother's house, and his name shall be called in Israel, 'the house of him that hath his shoe loosed.'" She repeats the last phrase three times, the assembly reciting it three times after her. Then the yabam returns the shoe to the court, and the judges say: "May it be the will [of God] that Jewish women be no more subjected to ḥaliẓah or to yibbum." As they rise, the chief of the judges says: "Blessed be He who sanctified us with the commandments and statutes of Abraham our father." All the passages recited by the yabam and by the yebamah must be read in Hebrew as they are found in the original in Deuteronomy, and if the parties do not understand Hebrew the passages must be translated for them (Eben ha-'Ezer, 169; "Seder Ḥaliẓah" and commentaries ad loc.). Various reasons have been offered for the ceremony of loosening the shoe. From the incident related in the Book of Ruth (iv. 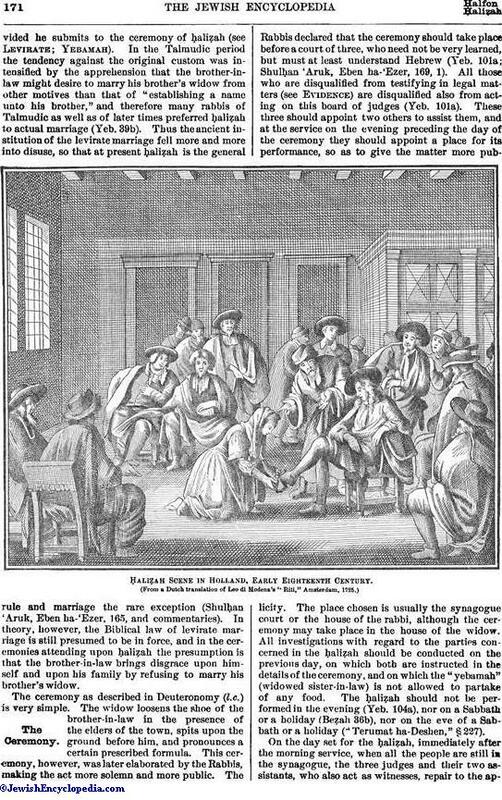 7, 8), which certainly refers to this ancient custom, it would seem that the loosening of the shoe was a symbol for a transfer of rights, and had no stigma attached to it. Some of the later rabbis (Jehiel of Paris, for instance) say that the removal of the shoe symbolized the entrance into a state of mourning. 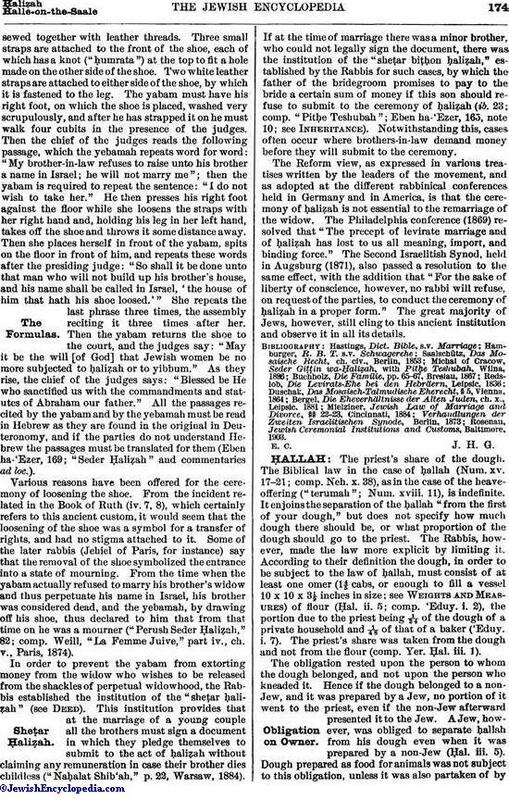 From the time when the yabam actually refused to marry his brother's widow and thus perpetuate his name in Israel, his brother was considered dead, and the yebamah, by drawing off his shoe, thus declared to him that from that time on he was a mourner ("Perush Seder Ḥaliẓah," 82; comp. Weill, "La Femme Juive," part iv., ch. v., Paris, 1874). In order to prevent the yabam from extorting money from the widow who wishes to be released from the shackles of perpetual widowhood, the Rabbis established the institution of the "sheṭar ḥaliẓah" (see Deed). This institution provides that at the marriage of a young couple all the brothers must sign a document in which they pledge themselves to submit to the act of ḥaliẓah without claiming any remuneration in case their brother dies childless ("Naḥalat Shib'ah," p. 22, Warsaw, 1884). If at the time of marriage there was a minor brother, who could not legally sign the document, there was the institution of the "sheṭar biṭḥon ḥaliẓah," established by the Rabbis for such cases, by which the father of the bridegroom promises to pay to the bride a certain sum of money if this son should refuse to submit to the ceremony of ḥaliẓah (ib. 23; comp. "Pitḥe Teshubah"; Eben ha-'Ezer, 165, note 10; See Inheritance). Notwithstanding this, cases often occur where brothers-in-law demand money before they will submit to the ceremony. The Reform view, as expressed in various treatises written by the leaders of the movement, and as adopted at the different rabbinical conferences held in Germany and in America, is that the ceremony of ḥaliẓah is not essential to the remarriage of the widow. 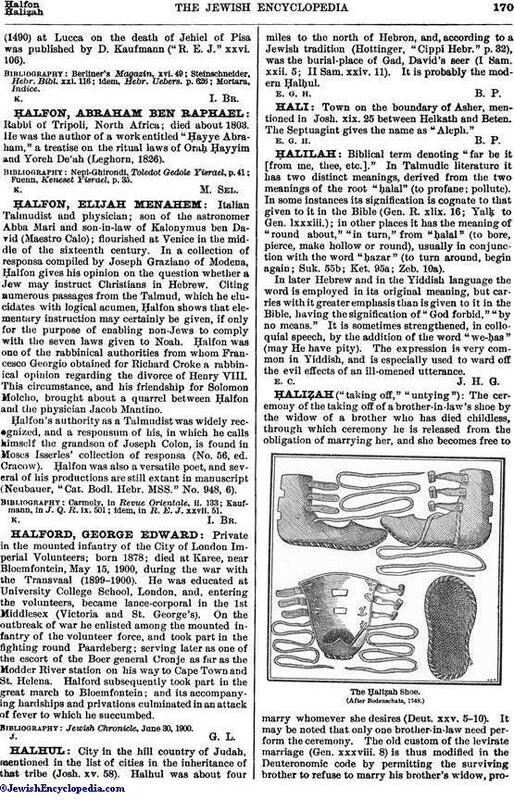 The Philadelphia conference (1869) resolved that "The precept of levirate marriage and of ḥaliẓah has lost to us all meaning, import, and binding force." 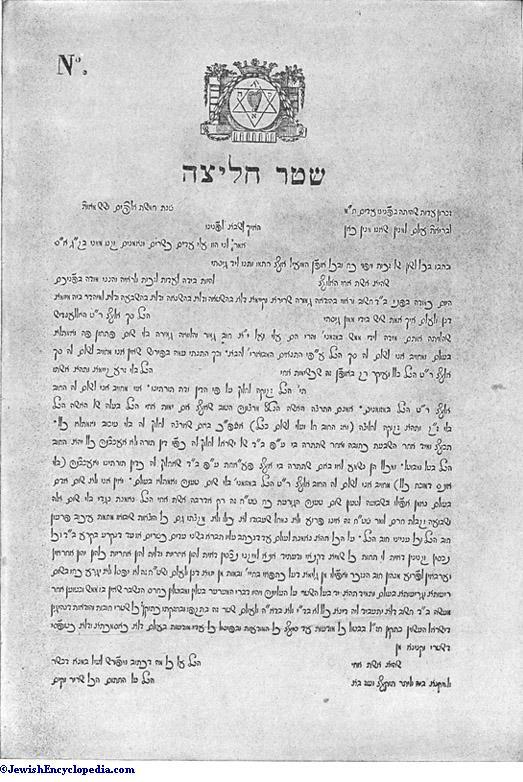 The Second Israelitish Synod, held in Augsburg (1871), also passed a resolution to the same effect, with the addition that "For the sake of liberty of conscience, however, no rabbi will refuse, on request of the parties, to conduct the ceremony of ḥaliẓah in a proper form." The great majority of Jews, however, still cling to this ancient institution and observe it in all its details. Rosenau, Jewish Ceremonial Institutions and Customs, Baltimore, 1903.